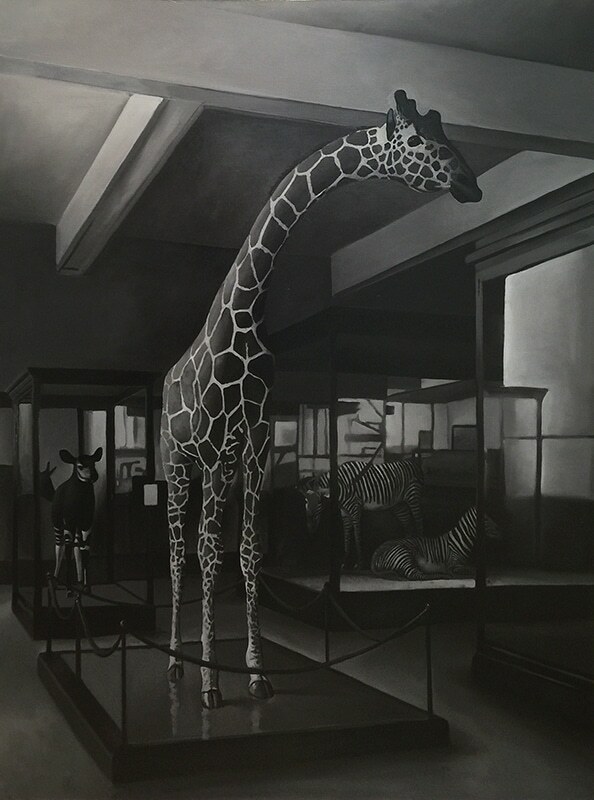 The latest body of work by Yale educated, Wyoming-based artist Chris Pfister is a collection of oil paintings executed in beautifully selected and hand-mixed palettes of grey, sepia and black and white. 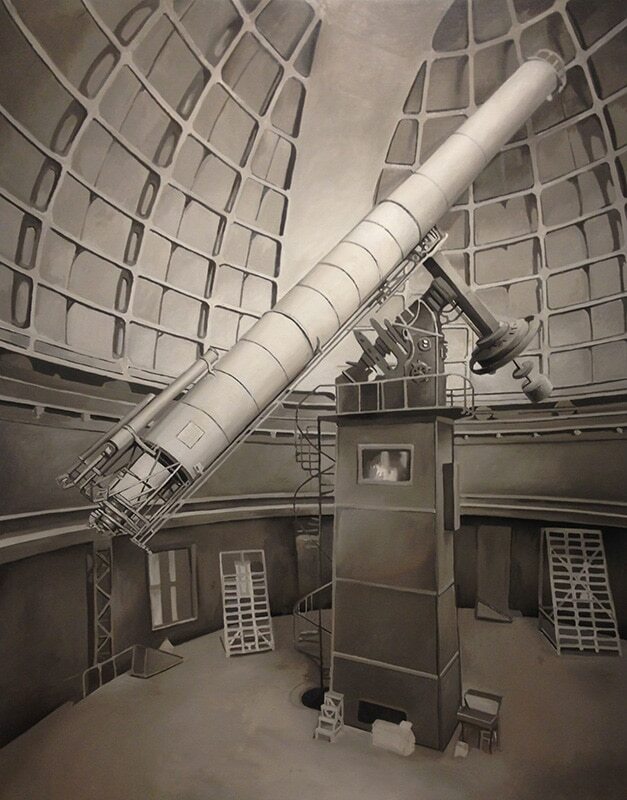 Pfister’s groupings make no overt declaration, but rather lead the viewer to investigate the history and interconnectedness of exploration and mechanization seen within the last two hundred years or so. Painted as snapshots of moments in history, Pfister’s groupings present a series of images that relate to one another in their sense of cause and effect, while documenting the growth and industrialization of our world. Chris Pfister was born and raised in Denver, Colorado, in 1957. In 1975, Pfister moved to Lewiston, Maine, to attend Bates College. Pfister had studied at Bates for two years when he was encouraged by his teacher, painter Robert Feintuch, to take part in the vibrant art world of New York City. In 1977, Pfister took his teacher’s advice and spent a year and a half studying at the New York Studio School, a unique and important institution founded by Mercedes Matter, a former student of Hans Hofmann. Pfister returned to Bates College later in 1978, following his time at the New York Studio School. A Bates French professor encouraged him to begin new studies in Provence, France (Pfister’s mother was a French native), where he worked from 1978-79 at at The Lacoste School of the Arts with painter Paul Resika, among others. Pfister received his bachelors in Fine Arts from Bates College in 1980. When he completed his undergraduate studies, Pfister returned to live in New York City but found himself with too little time for painting; he soon moved to Upstate New York. There he worked on a horse farm, doing the groundwork for racehorses. During his years in Upstate New York, Pfister rose early each morning, and completed his work on the farm by the early afternoon, so he could spend the remainder of his day painting. In this period of time, he created an impressive body of artwork and applied to the masters program in fine arts at Yale University, where he would later earn his MFA in 1985. Following Yale, after another decade and a half in New York City, Pfister re-connected with his roots and love of the natural world and moved to a ranch on Gooseberry Creek, Wyoming, where he has lived and worked for over 15 years. He divides his time between the ranch and Cody, Wyoming, where he lives with his wife and daughter. Pfister makes all of his own oil paints and starts each day in the studio by mixing colors. This devoted practice intensifies his relationship with painting and creates a uniqueness in his work. 1989 – “Memory and Artifact,” Barbara Fendrick Gallery, New York & Washington, D.C.
Ash, John. “Chris Pfister at Bess Cutler Gallery.” Art in America, November 1989. Anderson, Alexandra. “The Next Generation.” Smart Magazine, October 1989. Glueck, Grace. “The New Romantics Paint the Past.” The New York Times. September 10, 1989. Kimmelman, Michael. “So Sad, So Pastoral, So End of the Century.” The New York Times. October 20, 1989. Kimmelman, Michael. “Nocturnal Visions in Contemporary Painting.” The New York Times. October 20, 1989. Larson, Kay. “Memory and Artifact: Romanticism Revisted.” New York Magazine. November 13, 1989. Mahoney, Robert. Review. Arts Magazine. April 1988. Mahoney, Robert. “Gallery News.” Flash Art, April 1991. Mahoney, Robert. “Chris Pfister at John Post Lee Gallery.” Arts Magazine, September 1991. New Art Examiner. Review. Arts Magazine. April 1998. New York Magazine. Review. Arts Magazine. November 1996. Zinsser, John. “Chris Pfister.” New Art International. May 1989.